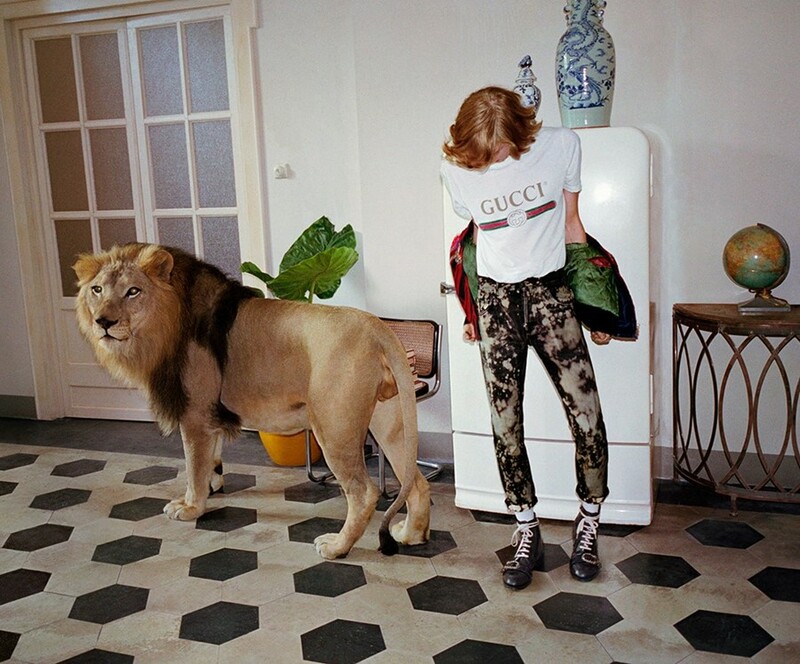 Gucci has just dropped its new campaign, and it’s got some unlikely stars: big cats. Alongside a model line-up that includes new faces Daisy Cvitkovic, Dwight Hoogendijk and the heavily-inked Lorens Miklasevics, the Glen Luchford-shot visuals feature a lion, leopard and tiger – which, in one shot, is pictured gnawing on a duffle bag. The images were shot in various locations around Rome, Gucci’s “homeland”, including a hotel, a café and the Trevi Fountain (which is pictured with the previously mentioned tiger wading around in it). “Wild cats nonchalantly roam the romantic city alongside our characters, a giraffe is fed grapes as they dine al fresco, and lions and tigers are welcomed into their home as they watch TV,” says Gucci of the campaign, which showcases Alessandro Michele’s 70s nightclub-inspired SS17 collection for the house. As usual, Michele cites very cerebral inspirations for this campaign – the house and studio of abstract expressionist Cy Twombly (whose work was recently celebrated in a major exhibition at Tate Modern), the work of postmodernist painter and collagist Mario Schifano, along with actress Laura Betti who was a muse of iconic director Pier Paolo Pasolini. See the full campaign in the gallery above and the accompanying film below.